Festival Report - Srila Prabhupada Disappearance Day & Marathon Launch ~ The Toronto Hare Krishna Temple! The month of Kartik presents a special time of year when there is ample opportunity for spiritual reflection, growth and inspiration. During this month, there are a multitude of festivals which help us to focus our lives in a very Krsna conscious fashion. 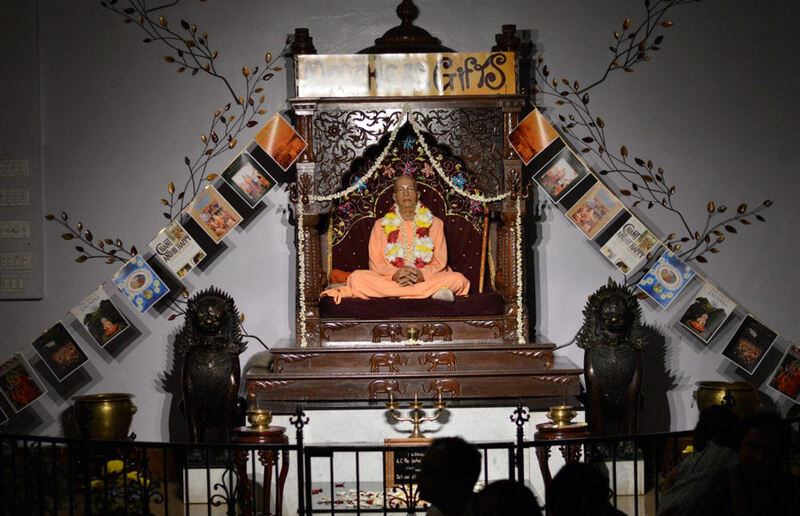 While most festivals involve grand celebrations, one special festival allows us an opportunity to reflect on the incredible life of Srila Prabhupada. On Sunday, November 15, 2015, the Toronto Hare Krishna Temple marked Srila Prabhupada's Disappearance Day (the anniversary of his passing). Festivities actually began at 11:30am with kirtan, a reading and the offering of flowers (puspanjali) to Srila Prabhupada. Later on, during the evening Sunday Feast, the festival continued with a class by both Bhaktimarga Swami and Krsnadas Kaviraj das wherein they expanded on the incredible contributions that Srila Prabhupada made to our movement and world. There was a very nice interactive element where the audience had a chance to share their realizations about Srila Prabhupada's contributions to the world. The special Sunday Feast also featured the launch of the annual Srila Prabhupada Book Marathon! During this time of year, known as the season of giving, Hare Krishna temples around the world make a focused effort to share and distribute as many of Srila Prabhupada's books as possible! To help pump our community with enthusiasm, devotees welcomed our famous "Walking Bhagavad Gita" who helped explain all the exciting things that will be happening during the marathon. One feature worth noting is the creative and unique "thermometer" which will help us see how we are doing on our goals for the marathon. Each week, a cutout of Srila Prabhupada will be raised up a ladder towards the Jaladuta (the boat which he traveled on to America in 1965). So, in essence, as we work towards our goal we will watch each week as Srila Prabhupada "climbs" the ladder and gets closer to the Jaladuta! All in all, it was a special Sunday Feast where we had a chance to honour Srila Prabhupada and also get enthused about one his most dearest desires - sharing his books with the world!